A 6 year winning streak with DITA and Componize! Esko is the worldwide market leader in the software, hardware and services essential to the creation, production and automation of product packaging. Esko provides large-scale printing to companies around the world with roughly 50 different software solutions including structure design and graphic software, virtual mockups, and system integration. As early as 2008, following rapid growth and recent merge, the Esko software documentation team had expanded to include teams from two continents and SMEs spread between US and Europe. They also faced a new, critical challenge: take on the new product lines and modernize and standardize all product documentation. After significant research, the documentation team leader found that the DITA standard would be the right fit. 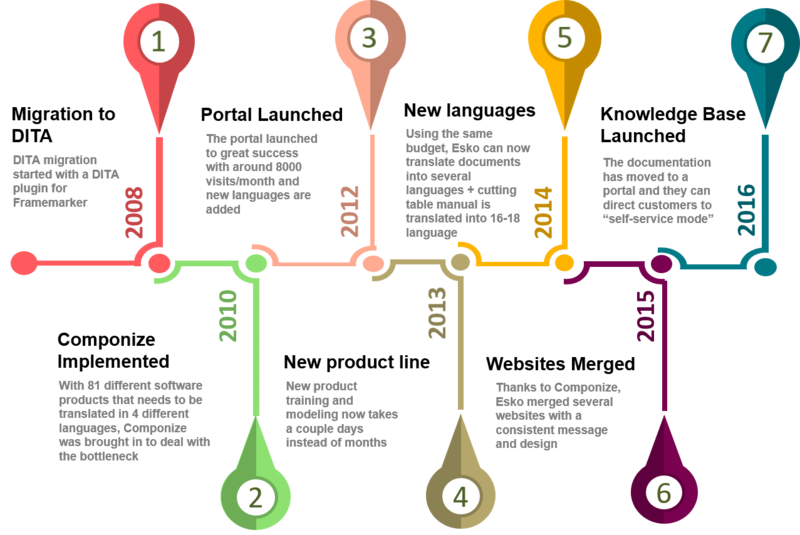 DITA was rapidly becoming a long-term, international standard for technical documentation. For the Esko team, selecting DITA meant that there would be no risk of obsolete programs, guesswork or irretrievable elements in the system – even in the long run. Since DITA is an open standard, there are no licensing headaches or costs for using the basic structure. Moreover, DITA is perfectly designed to allow users to create and manage document components, or simply put, individual ideas, not necessarily whole documents. 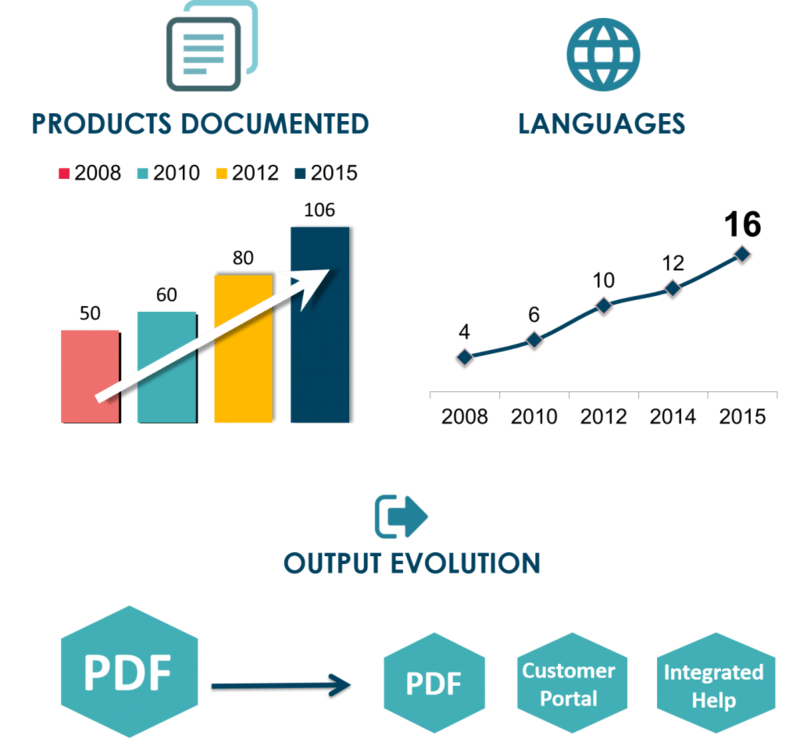 This creates greater flexibility and potential time savings for the production, reuse, translation and adaptation of documents – if the right software tools are available. Esko found that there were indeed some very exciting tools available that made DITA even more attractive. Enter Componize. Native DITA support: The Esko team found that many other vendors purported to work with DITA, but in fact the systems change the DITA content by injecting proprietary mechanisms to manage links or versions. This threatens the longevity and flexibility of the system Esko envisioned. With Componize, Esko was able to always work in native DITA files. Excellent support – During the entire project, Esko found that they had real partners with Componize, whom they could easily work with and trust to deliver a quality product and service for such a business-critical effort. Link handling – With Componize, the new document could be easily dropped into the folder structure in which all files – dita topics, different languages, assets (images etc), dita maps, ditaval filtering files, etc – are kept. It was adapted only a couple of times during the last 5 years. Reorganizing the link was simplified, thanks to Componize’s Link Maintenance, something which was impossible before. Adding new people to collaborate took only a couple of hours dedicated to explaining where to add the content and adding new or existing product lines proved to be just as easy. Within a year, they achieved their return on investment to produce outputs exponentially. Operations that took 2-3 days or more was reduced into one hour. Migrating new documents was easy with the support of links and file names in Componize and the team could adapt the structure of newly migrated documents easily. On top of this, the workload for each output was streamlined, turning a complex “export-import through exchange format and check” kind of workflow to a simple publish and check. Even better, the team developed confidence in the publishing process and they now only needed to press a button to produce the document. For graphic designers, this is no small feat! The last changes came with maintenance issues on the product name, which could be updated in the blink of an eye. Esko also integrated an existing product line in their offering, the Kongsberg cutting table. The person in charge of the documentation only needed a few days to model their content, migrate and start using DITA and Componize, and started producing right away – drawing experience and reusing the stylesheets and processes matured by the software team. During the next several years, the team grew and took on new partners or consultants, where training to use the system only required a couple of hours. With a reuse percentage averaging 50%, the publishing spread to all target languages, resulting in even more time savings and costs savings. David Heijl, Customer Engagement Platform Manager, noted “Esko had been doing things right, our information structure is sound, our tool choice remains the right solution. DITA and Componize has really proven the right path for Esko”. Among the benefits, team members could now collaborate more easily than ever on different products, sharing and updating common information modules. Publishing is as easy as a click and the cost per multilingual output has reduced drastically. The team increased their productivity and could concentrate on their content and their users to take on new challenges. Today, tech writers are now viewed as user assistance designers. What was once considered primarily as a cost center at the start of the project, the technical documentation team have successfully proven that documents are now consulted by the customers though the online portal, thus contributing to customer satisfaction. The team now looks forward to new challenges, such as controlling better their variants with Componize branch and merge features, responsive design, and merge the actual three main websites into one. Esko is the worldwide market leader in the software, hardware and services essential to the creation, production and automation of product packaging. In this context, Esko provides large-scale printing companies around the world with roughly 50 different software solutions such as structural design and graphic software, virtual mockups, and system integration, among others.